New Series: Mountain Monsters, Premiering June 22. Destination America is getting into the legendary monster business again. Coming on the heels of its series Monsters and Mysteries in America comes the new series Mountain Monsters, premiering June 22. Like Monsters and Mysteries in America, Mountain Monsters focuses on the search for creatures out of folklore that have been reported in real life. In this series, the hunt is restricted to the Appalachian area, searching for the mythical beasts reported to haunt the dense woods and murky lakes within this 1,500-mile long mountain chain of the eastern United States. Beyond narrowing its focus to a specific region, Mountain Monsters also differentiates itself from Monsters and Mysteries in America by adding a sort of reality show, Finding Bigfoot-type of element, giving us some quirky, native West Virginians who make it their task to seek out these creatures. Known as The Appalachian Investigators of Mysterious Sightings (AIMS), this band of hunters and trappers (pictured below) is led by founder John “Trapper” Trice, and attempts to use backwoods ingenuity along with traditional techniques and modern technology to snare the legendary beasts and help local mountain communities. 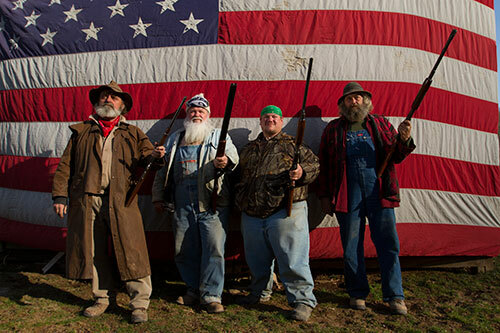 Destination America says there will be six episodes in the first season of Mountain Monsters. interesting show. hope it doesn't turn out to be like other reality shows in which things are staged. Yeah I agree. I haven't seen it yet but hope it comes on YouTube or some form of free media. Like pro wrestling so far. Totally staged but can't stop watching it. Whole show is watching them watch something. Appears to be very much staged. I hope I am wrong. Every show they always seem to come up with some proof. The hunt appears always the same same sequences.